My husband is a pecan pie fanatic. He loves everything about it. Except for the calories, that is. He’s been trying to lose a bit of weight and having a whole pecan pie on the table for the holidays might be just a bit more than he can resist. 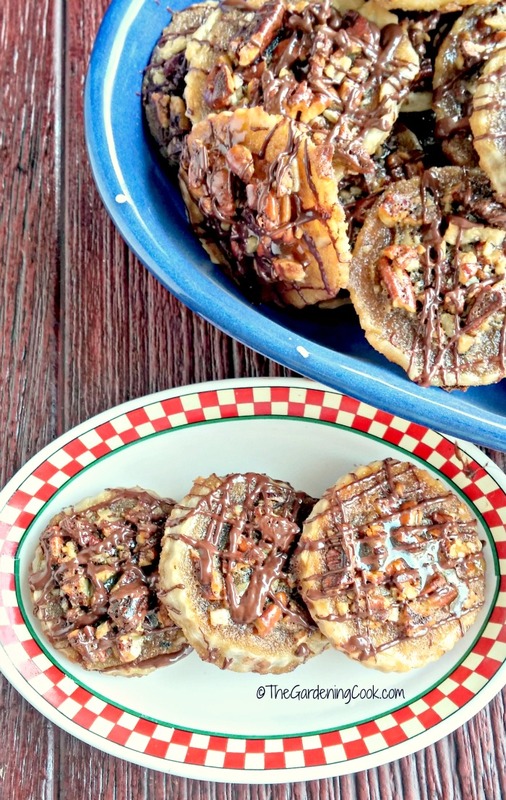 Enter my recipe for pecan pie cookies! These pecan pie cookies are the perfect choice for your next cookie swap, or to add to your holiday dessert table. I love making cookies this time of the year for cookie swaps. Another great Christmas cookie recipe is the one for lemon snowball cookies. 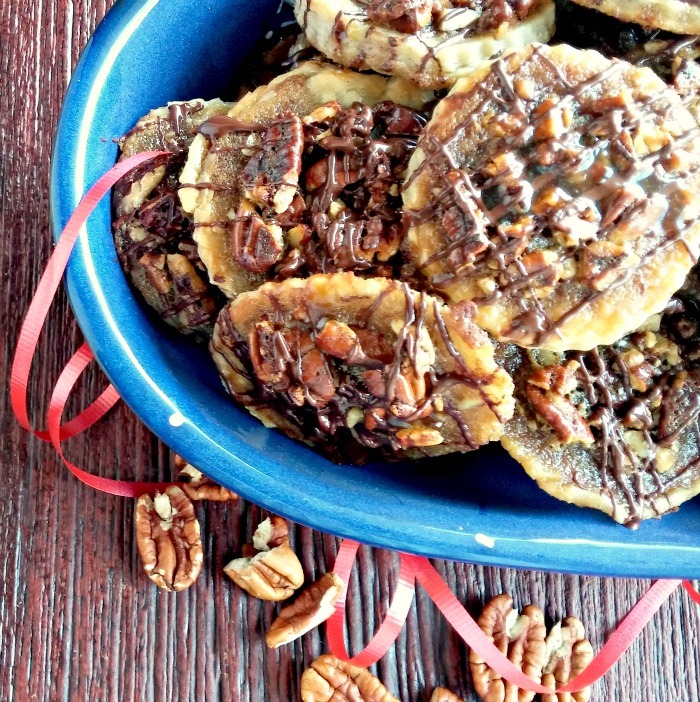 They bring out the holiday spirit just like these pecan pie cookies do. 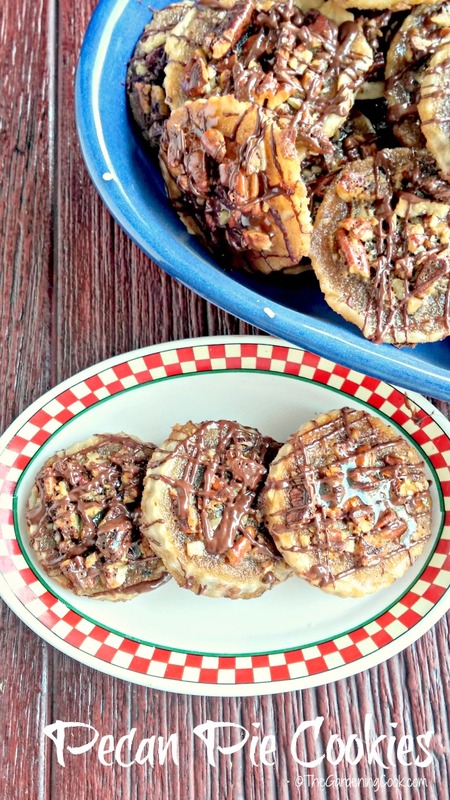 These delicious pecan pie cookies have all the flavor of a pecan pie in a more manageable size. I can have just one or two out for him to enjoy without tempting him to eat that whole pie. The cookies are amazing. They have the delicious flavor of the sweet, caramel-y, pecan filling and instead of a cookie base, I make them with flaky pastry! The best of both cookie and pie worlds, and hubby won’t feel as though he is cutting back at all. 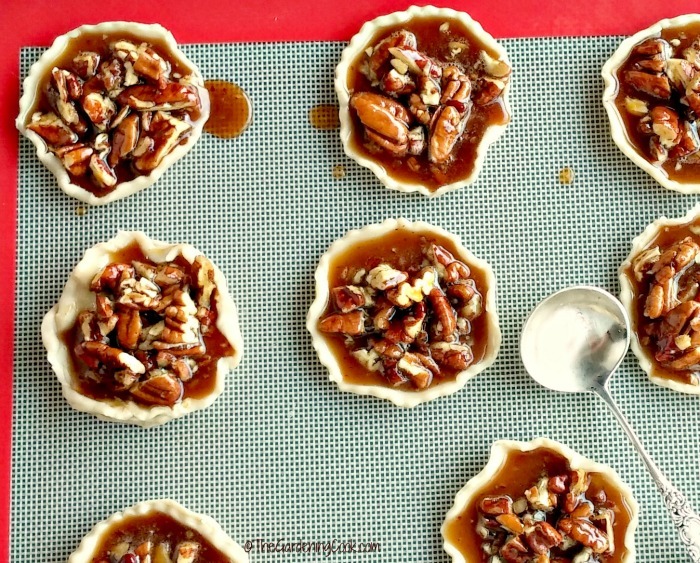 They give the feeling of mini sized scrumptious individual pecan pies. Just like all of you, I am so busy this time of the year, so making these cookies instead of going whole hog on making pie crusts and every thing else that goes into a pecan pie appeals to me. They are super easy to make and so, so good. And to make life even better in the waistline department, I am using my favorite brown sugar substitute – Splenda’s No Calorie Brown Sugar Blend. This delicious substitute for brown sugar keeps all the flavor in my cookies but cuts down dramatically on the calories. It’s a win- win! Add this to pecans, eggs, pie crust, baking chocolate and corn syrup and you have a match made in pecan pie heaven. SPLENDA® is the perfect sweetening choice for those who are trying to follow a balanced eating lifestyle without compromising on the tastes of the foods they love. The brown sugar blend can be used anywhere you would normally use brown sugar, without adding the calories that normal sugar has. It can be swapped cup for cup for brown sugar, or you can use it by cutting half the sugar and replacing it with the blend, thereby saving half the calories. Either way, the end results are delicious! These cookies could not be easier to make. Start by making your filling on the stove over a low heat and be sure to stir slowly. You will want it to be about the consistency of pudding when it is made so that it will be easy to spoon into the pie-cookies. Roll out your dough (I used a store bought dough to save time, but home made is fine too.) Cut 3″ circles from the dough and crimp up the edges about 1/4″ to resemble small pies. Spoon in the prepared pecan/brown sugar filling. I used a cookie cutter with a crimped edge. I used a silicone baking mat to cook my pecan pie cookies. These mats are wonderful for a dessert like this that is a bit sticky. The mats make perfect cookies every time with no sticking and no over browning of the edges. When done, let the cookies rest on a wire rack. I know, I know….you’ll be tempted to just gobble one up right way, but that filling will be hot and will need a rest. 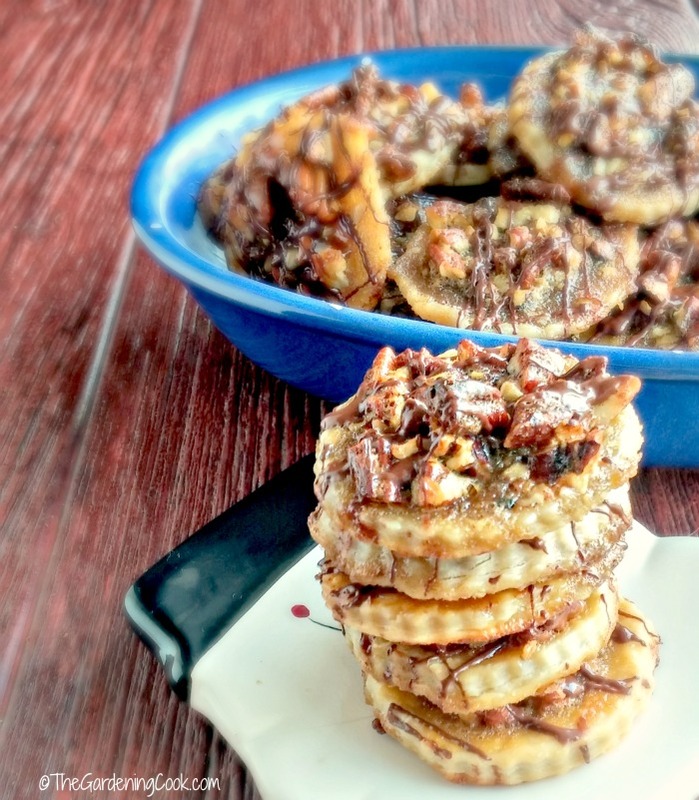 Ooey, gooey, pecan pie mini cookies with the wonderful taste of brown sugar. So tasty. Perfect for a husband who loves pecan pie but wants to watch his portion control too. 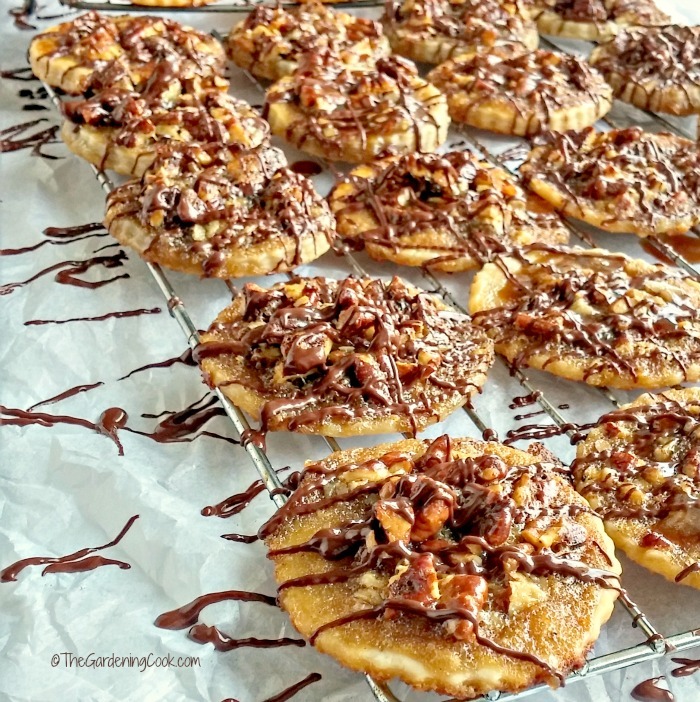 The pecan pie cookies have an easy to make chocolate drizzle. I just melted good quality semi sweet chocolate in the microwave and placed it in a zip lock baggie with the tip cut off and then drizzled it over the cookies when they had rested a bit. The cookies remind me of Turtle candies, pecan pie and cookies all rolled up into one delicious bite. The filling is sweet and decadent with a crunch from the pecans and the bottom of the cookie is flaky like a pie crust. 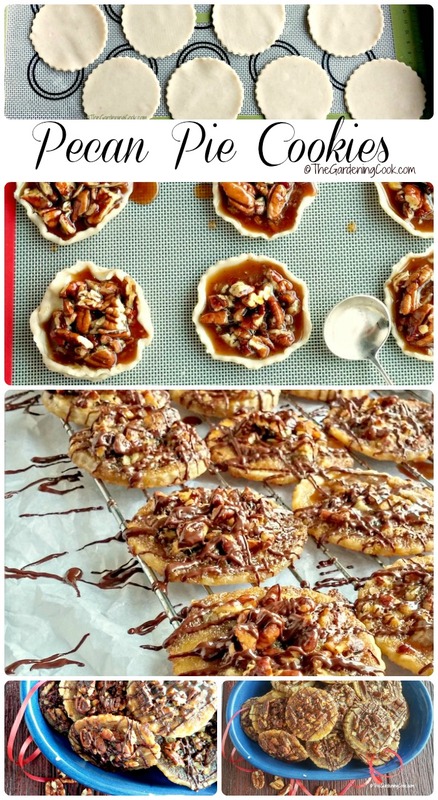 These pecan pie cookies are sure to become the hit of your holiday dessert table. Want some more sweet swap inspiration for lower calorie dessert for the holiday season? 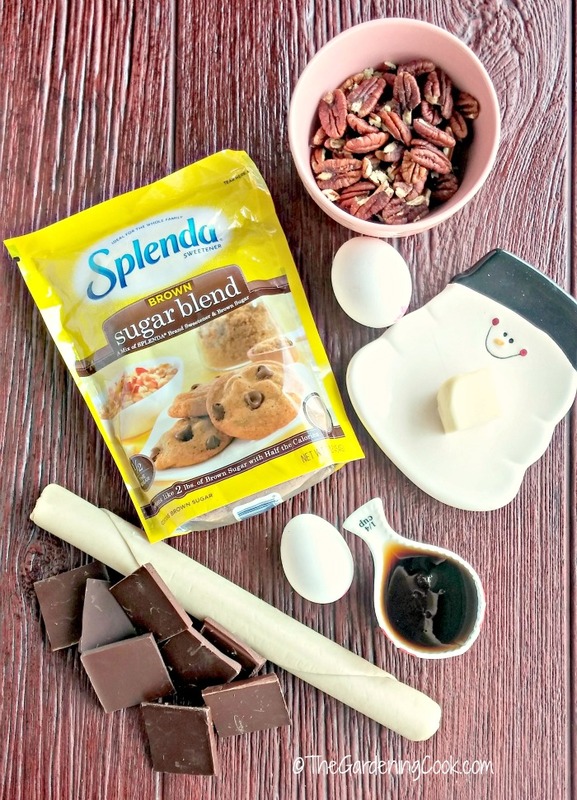 Visit the Splenda sweet swap site for lots of delicious ideas. There are recipes, tips and tricks to make your holiday baking easy on the waistline every time. What is your husband’s favorite holiday treat? Please let me know in the comments below. 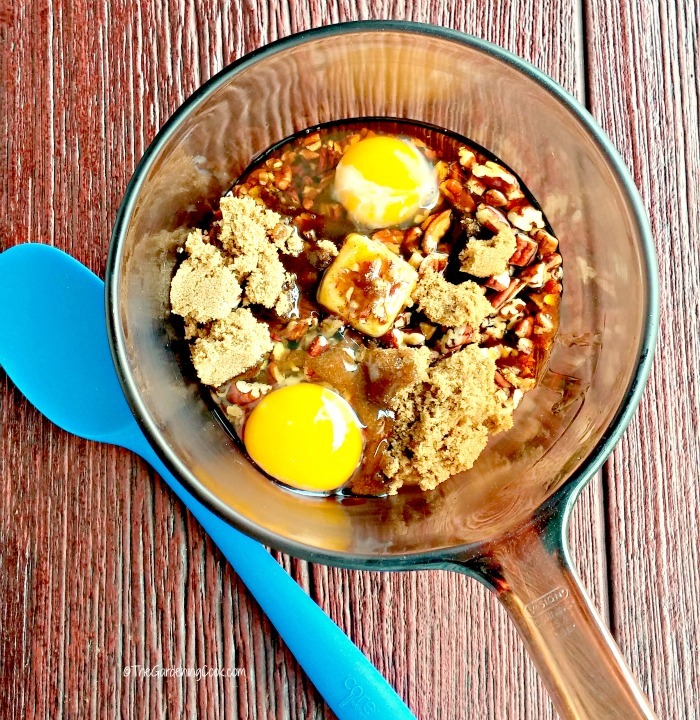 In a large saucepan, combine the butter, pecans, brown sugar blend, corn syrup, salt and eggs. Cook on the stove top over medium ­low heat just everything has combined and it is just starting to get thickened - about the consistency of butterscotch pudding. Remove from heat and set this mixture aside. 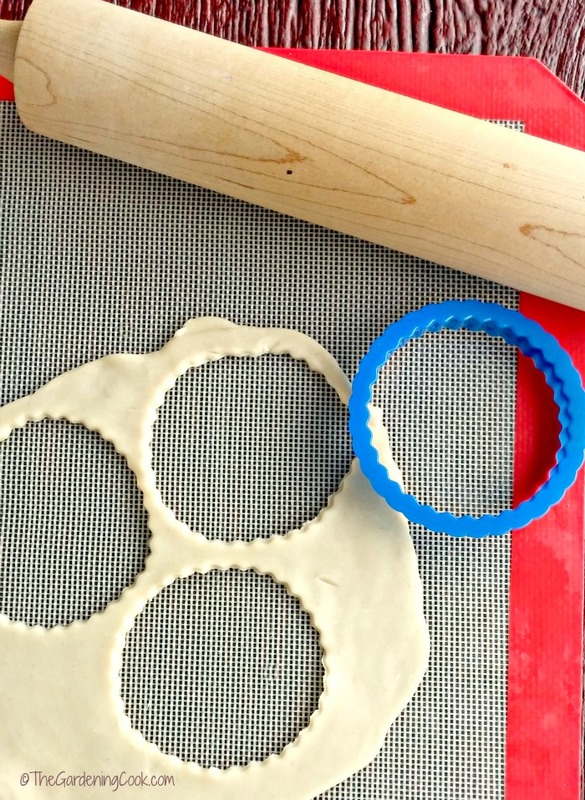 Unroll your pie crust dough and cut out circles using a 3" cookie cutter. Gently fold about ¼" up on the edges to form the shape of little pies and make sure the base is about ¼" thick. Spoon just 1 tablespoon of the pecan mixture into each circle. Place the cookies on a baking sheet lined with a silicone baking mat. Bake for 10-12 minutes or until the filling is just set and the edges are lightly browned. Remove from oven and cool on a wire rack. Place the baking chocolate pieces in a small microwave safe bowl and heat about 15 seconds or until melted. Add the melted chocolate to a zip lock bag. Snip off a tiny corner of the baggie and drizzle chocolate over the cookies. Cool until set. Store in an airtight container. Enjoy! How much brown sugar blend? It’s missing on recipe! Hello. Do you pre cook the pie crust?